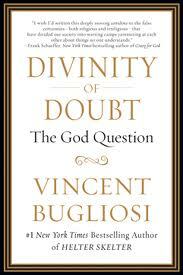 A few weeks ago I was contacted via email by someone from FSB Associates wanting to know if I would like to do a review on the book, The Divinity of Doubt: The God Question (Vanguard Press, April 2011) written by Vincent Bugliosi. I had never heard of Mr. Bugliosi, but I quickly googled his name and learned he was a lawyer, not just any lawyer but the lawyer that prosecuted Charles Manson. I had to wonder what a lawyer who had such high-profile cases would have to say about God. Bugliosi himself states, in the preface, that he is a “very critical person”. Indeed he did take that stance with each chapter in this 338 page book. From tackling “Atheism and it’s Current Leading Prolocutors” (chapter 4) to “The Intelligence (or Lack Thereof) of Intelligent Design, and First Cause” (chapter 6) Mr. Bugliosi calls it as he sees it. From a touching story about a family pet to big questions such as if God exists why does he remain silent, Bugliosi has an opinion and manages to get his readers to think about the questions he poses. The Divinity of Doubt: The God Question was a thought-provoking read and one I would recommend. It asks that one question we’ve all wondered at some point in our lives. Does God Exist? Disclaimer-I received this book free from FSB Associates. All that was required of me was to write a positive or negative book review on my site. To purchase the book visit The Divinity of Doubt website to see where books are available near you. This entry was posted in Agnostic, Atheist, Christian, God, Reading, Uncategorized and tagged Agnostic, Atheist, FSB Associates, reading, The Divinity of Doubt, Vincent Bugliosi. Bookmark the permalink. Well, you have peaked my interest in it….I may have to read that sucker! Sounds pretty good. Maybe when I’m done with Human Faces of God I’ll pick it up. Thanks for the review.